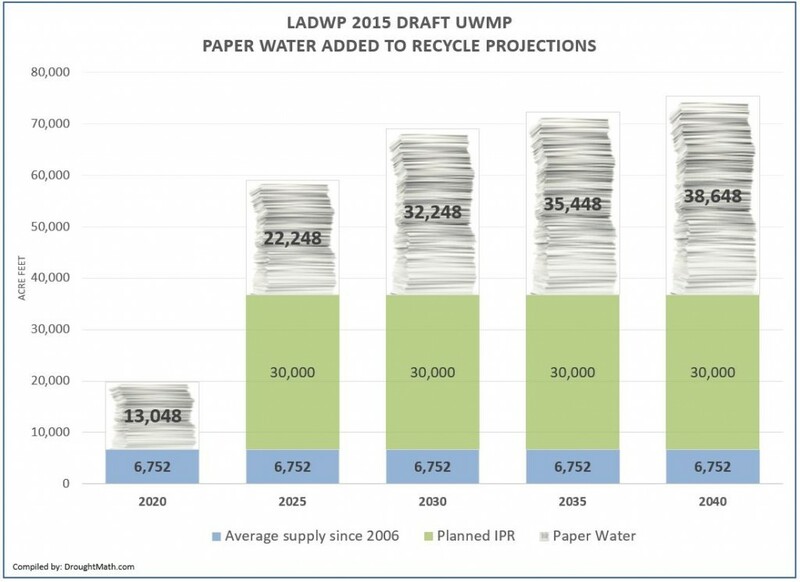 Now that we find that the City of Los Angeles routinely props up its water portfolio using 'paper water' so where do we find it? 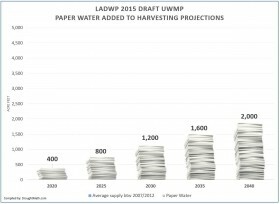 We first find evidence of the city's reliance on paper water in the groundwater projections cited in each of the Urban Water Management Plans between 1985 and 2005. 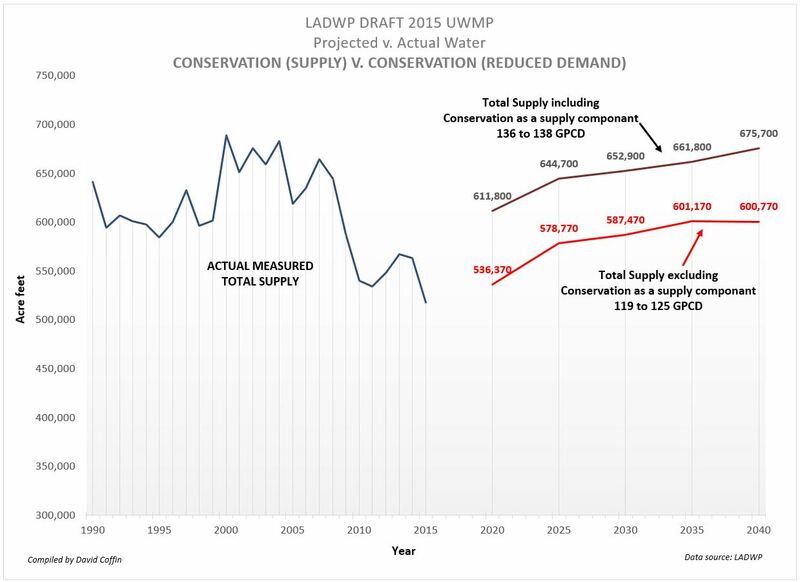 Groundwater supply is just 67% of UWMP projections. 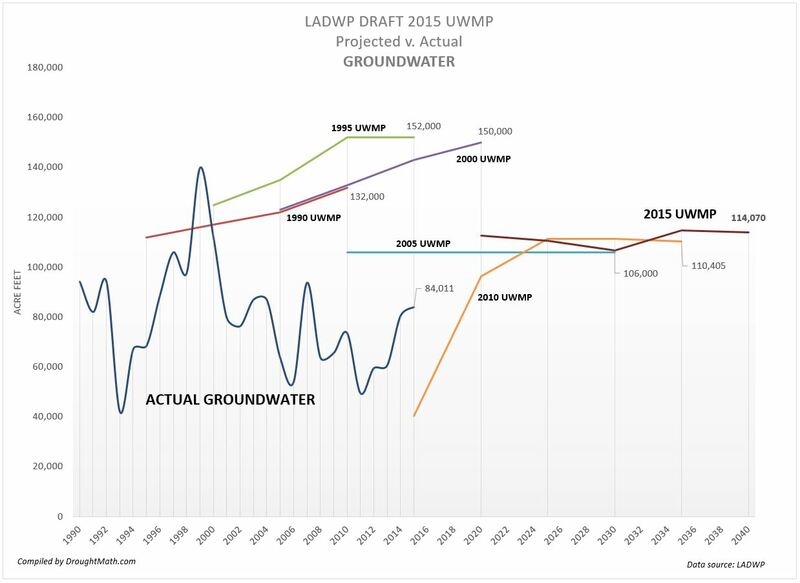 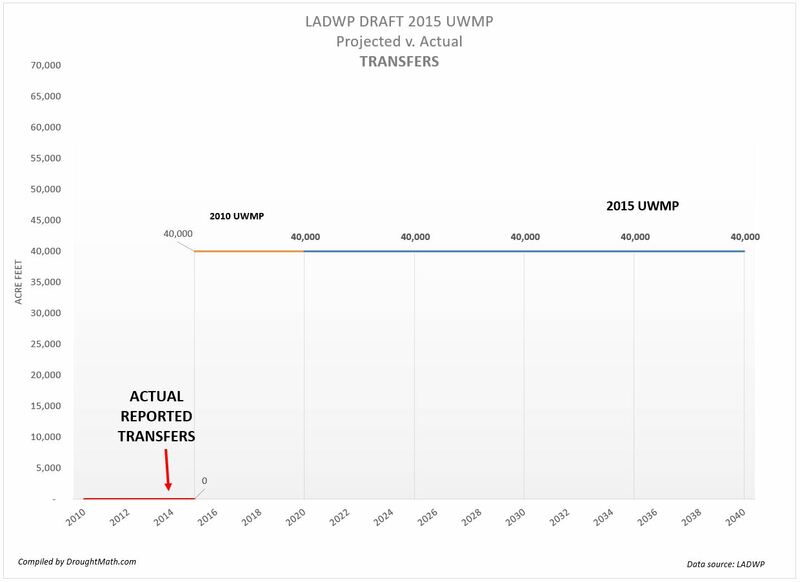 The chart at the right plots the gap between the actual groundwater supply the city had access to and the anticipated supplies that each UWMP projected. 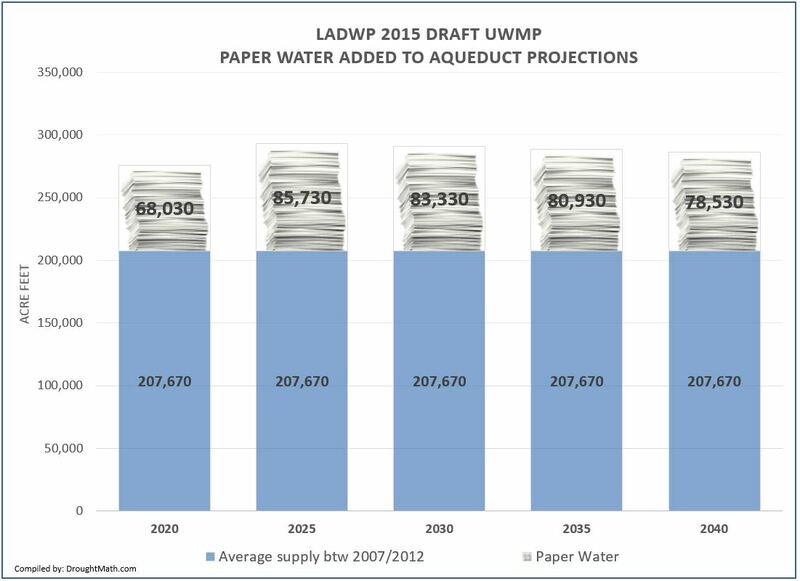 The gap between the two is the paper water that would be used to as evidence that medium and high density projects going through the planning process would have sufficient water when in fact they didn’t. 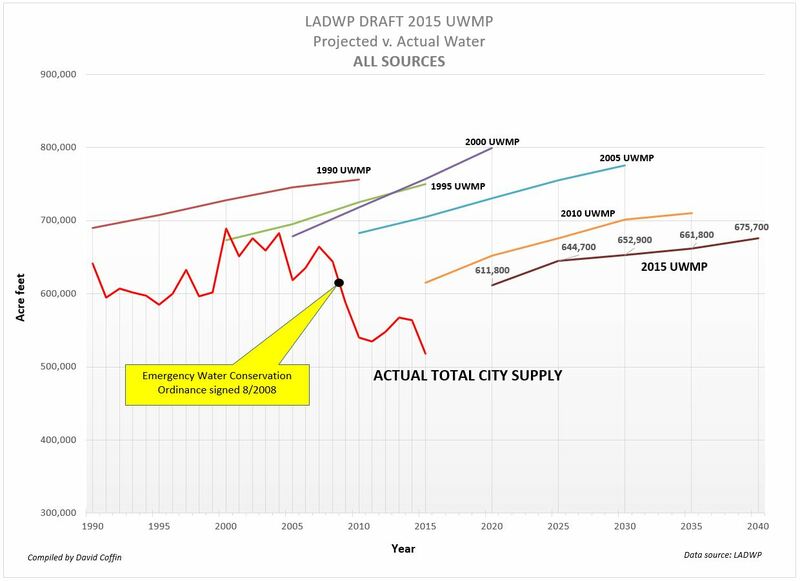 The city routinely projected supplies that ranged from 103,000 AF to 155,000 AF during that period. 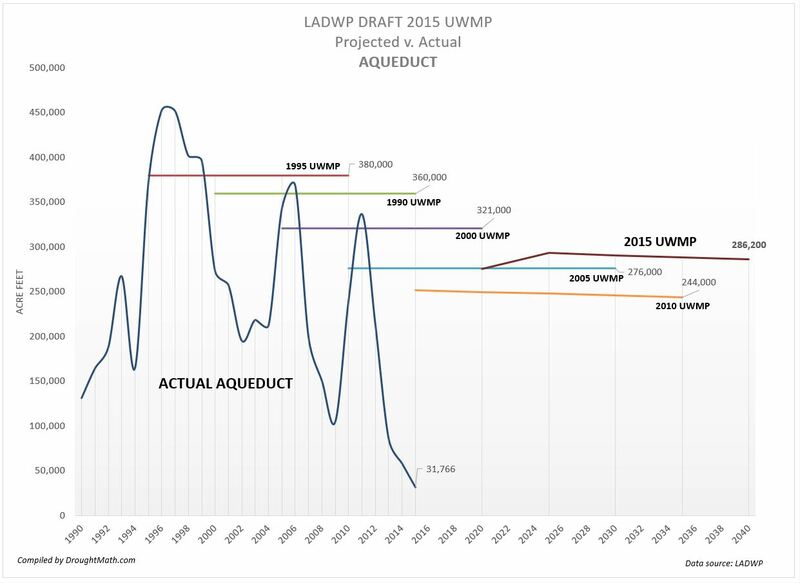 Including a brief period between 1997 and 2000 of exceptionally high pumping, the actual amount of well water produced by the city was 33% below expectations. 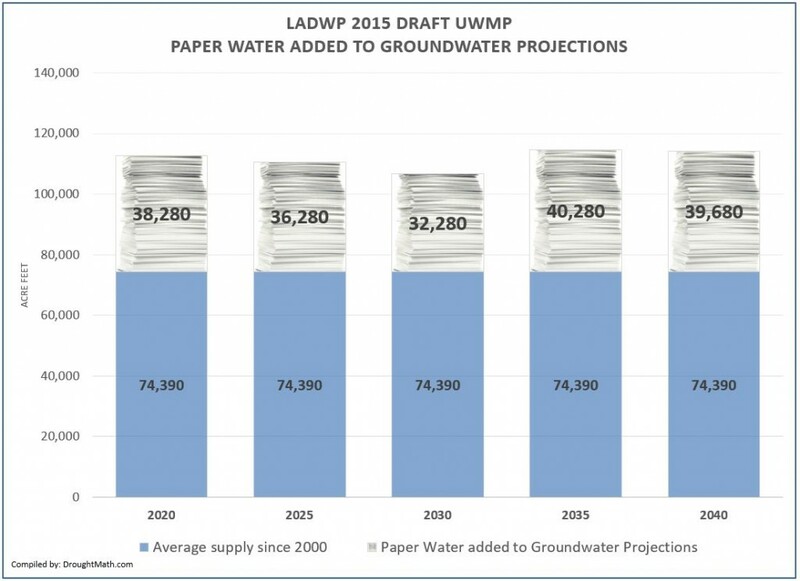 Far below the city's expectations and glossy presentations that suggested that growing groundwater supply would help the city meet its needs and allow its growth ambitions. 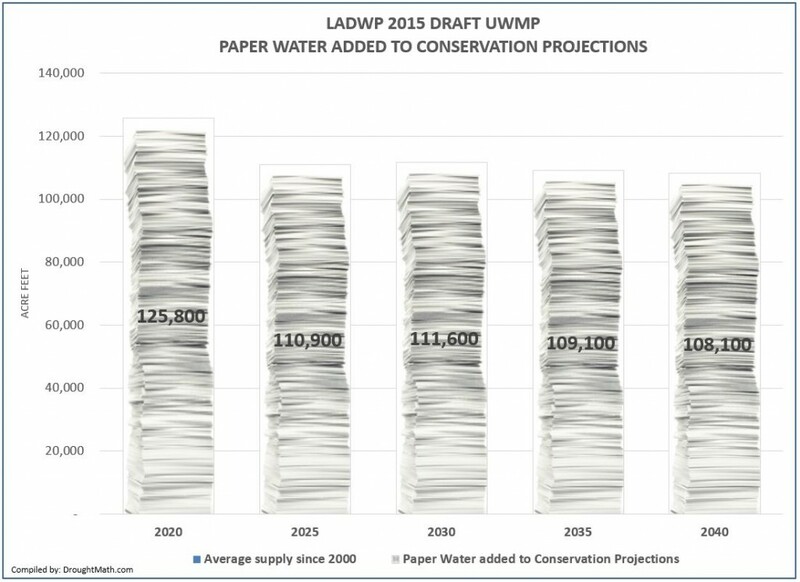 Despite the city's average of just 71,000 AF since 2001, the city's current 2010 water plan continues propping up it's paper water inventory citing that it should an average of 107,426 af/y in available groundwater supplies between the years 2020 and 2035. 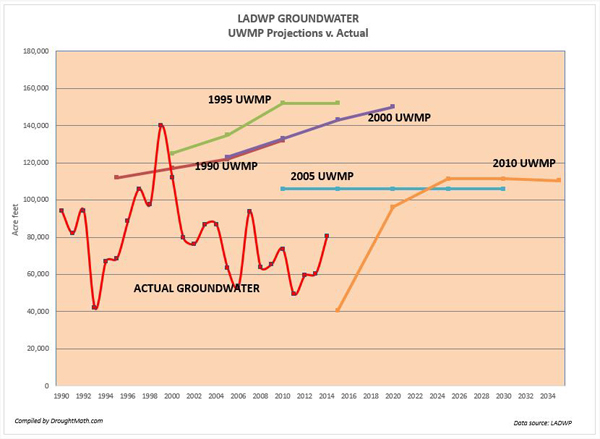 Between 2000 and 2014 the city's groundwater supply would remain flat at 71,059 af/y which is far below any of the past UWMP projections that ranged from 103,000 af/y to as high as 152,000 af/y. 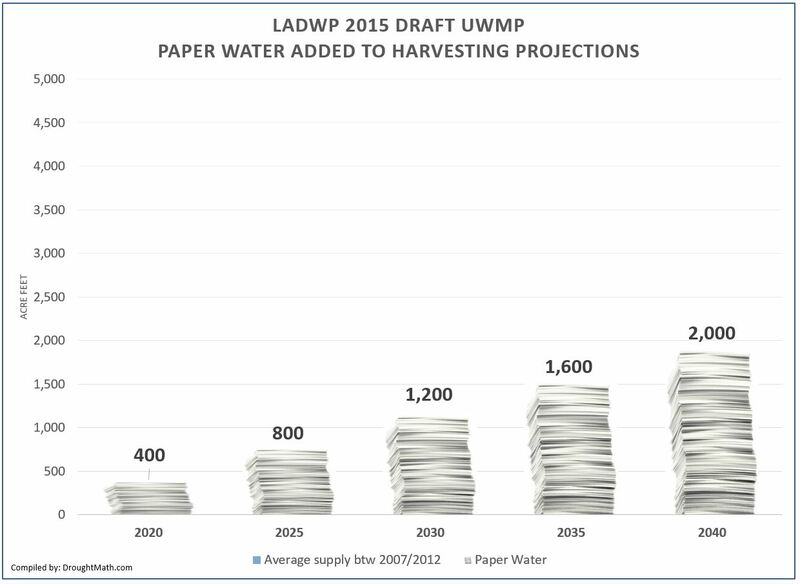 Paper Water This gap between 'projected or anticipated supply' and 'actual supply' is an unfortunate characteristic of the city's water supply. 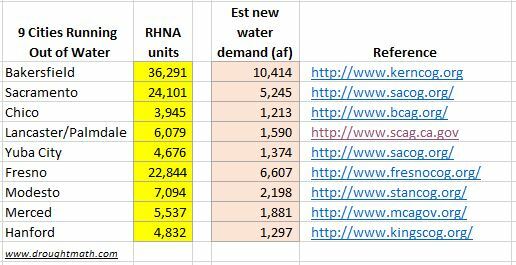 It's a promise spanning 5 water plans and 25 years that was used to mischaracterize the city's supply to approve high density development. 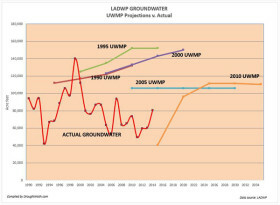 The City's failure to meet groundwater projections stems primarily from the fact that it is just storage. 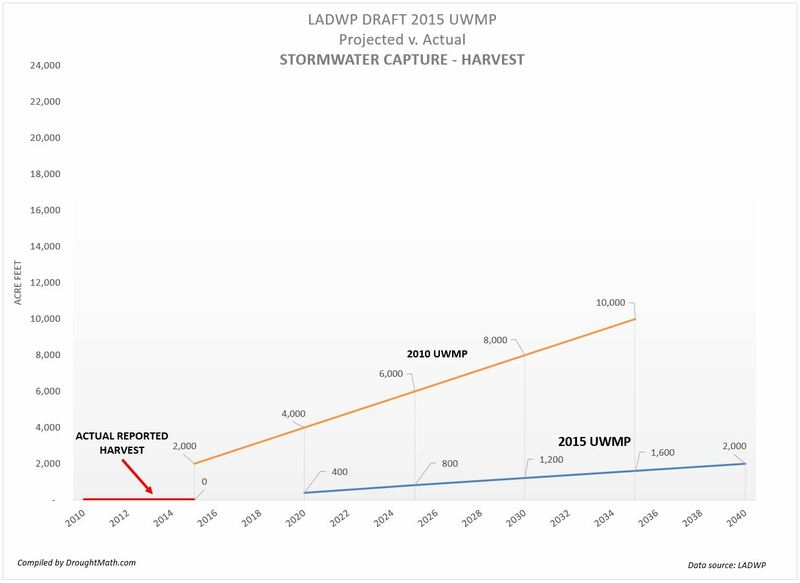 The City of Los Angeles Stormwater Program reports that the city captures just 27,000 AF of water to recharge the underground storage. 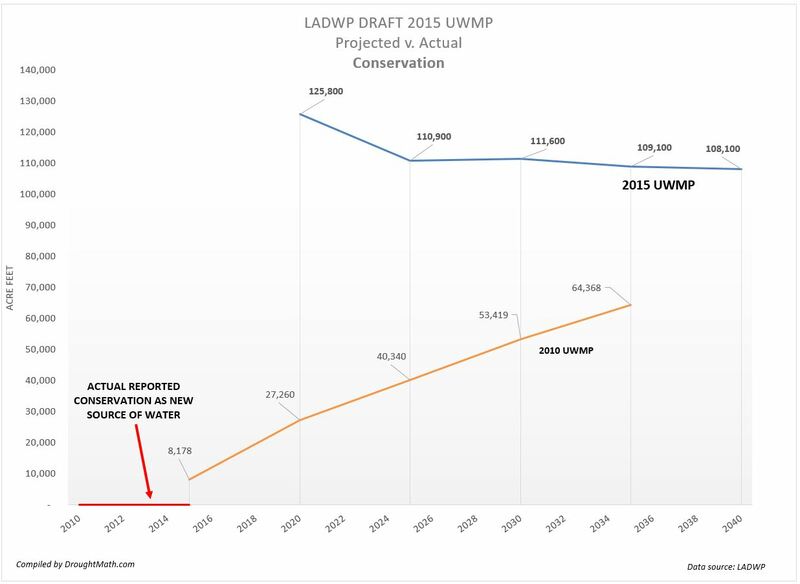 The reason for this can be found in Upper Los Angeles River Area Watermaster reports which state that "The continued growth of residential, commercial, and industrial developments has required that more water be imported to supplement the local groundwater supplies in ULARA over time. 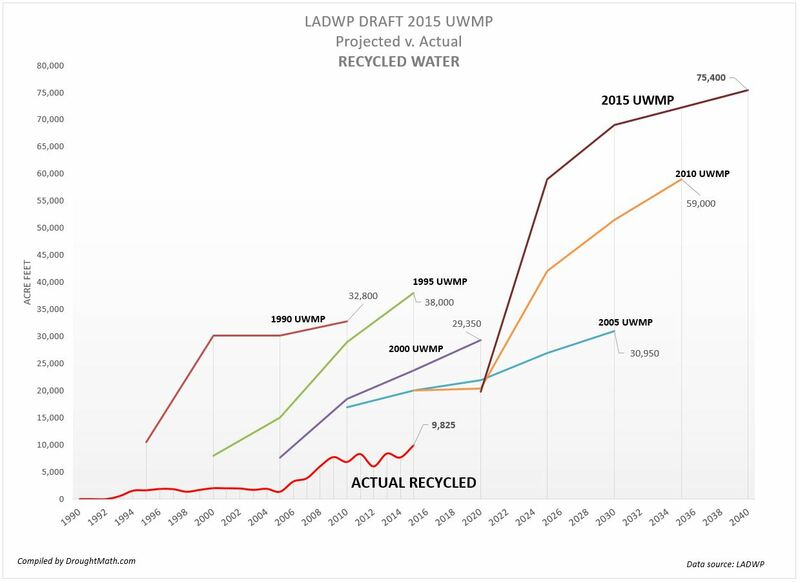 Imported supplies to ULARA are from the Los Angeles Aqueduct and from MWD". Because of the extent of development in the valley, much of today's potential groundwater supply is simply channeled into storm drains and down the LA River. 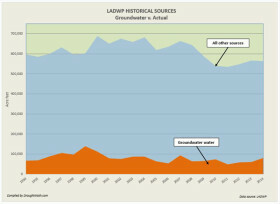 Secondly, ULARA reports that many of the San Fernando Valleys groundwater pumps have been taken out of service due to groundwater contamination.